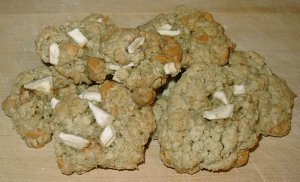 Incredibly addictive and satisfying, these cookies are a simple twist on plain oatmeal cookies that makes them absolutely divine! They are quick and easy to make, freeze well, store well, and make the perfect party food, lunch box stash, or cookie jar filler. The recipe doubles or triples easily - which you will be very thankful for as soon as you try it! Preheat the oven to 350 degrees and line two baking sheets with parchment paper or grease lightly. Whisk together the flour, baking soda, and salt in a small bowl and set aside. In a large bowl, cream the butter with the sugars until light and fluffy. Add the eggs one at a time and mix well until fully incorporated. Mix in the vanilla and then the flour mixture until fully incorporated. Stir in the oats, apples, and chips and mix well. Drop by rounded teaspoonfuls onto the prepared baking sheets, leaving 1 1/2 inches between the cookies. Bake for 10-13 minutes or until pale golden brown. Cool the cookies on the sheets for 1 minute, then remove to a rack to finish cooling.